(NASA via AP) This illustration made available by NASA shows the rover Opportunity on the surface of Mars. The exploratory vehicle landed on Jan. 24, 2004, and logged more than 28 miles before falling silent during a global dust storm in June 2018. There was so much dust in the Martian atmosphere that sunlight could not reach Opportunity's solar panels for power generation. 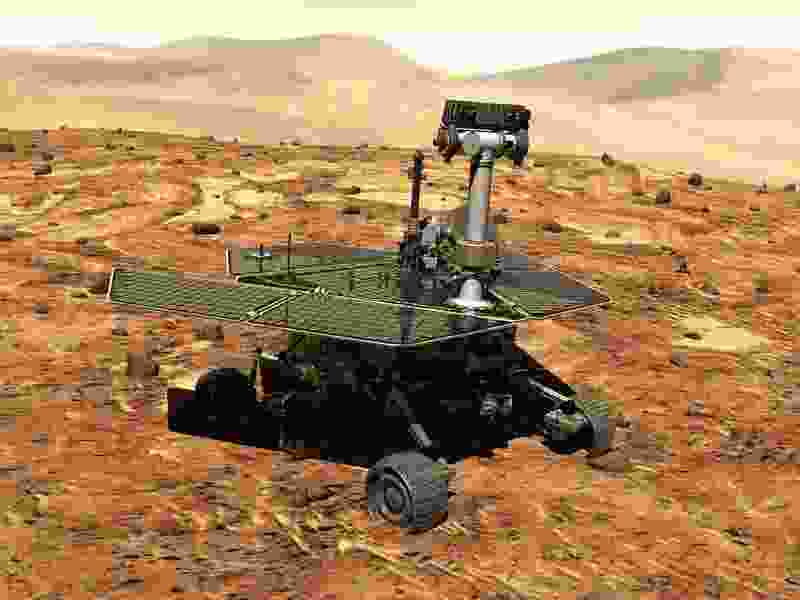 Cape Canaberal, Fla. • NASA’s Opportunity, the Mars rover that was built to operate just three months but kept going and going, was pronounced dead Wednesday, 15 years after it landed on the red planet. Rolling along until communication ceased last June, Opportunity roamed a record 28 miles around Mars and worked longer than any other lander — anywhere, ever. (Davide Coero Borga | INAF/ESA via AP) This image provided by the ESA/INAF shows an artist's rendering of the Mars Express spacecraft probing the southern hemisphere of Mars. At upper right is the planet's southern ice cap. The inset image at lower right shows the area where radar readings were made. The blue triangle indicates an area of very high reflectivity, interpreted as being caused by the presence of a reservoir of water, about a mile below the surface. (NASA/JPL-Caltech via AP) This composite of May 2017 photos made available by NASA shows "Perseverance Valley" which just on the other side of the dip in the crater rim as seen by the Mars Exploration Rover Opportunity, in preparation for driving down into the valley.